If you love your pumpkin and chocolate, combine the two in these soft, cake-like cookies. Pumpkin and chocolate may seem like an unlikely combination, but they seem to work magically together. Made with pumpkin, sweetened with apple sauce, spiced up with cinnamon and dressed up with chocolate chips, they are the sort of cookie you want to settle down with on a cool autumn evening. 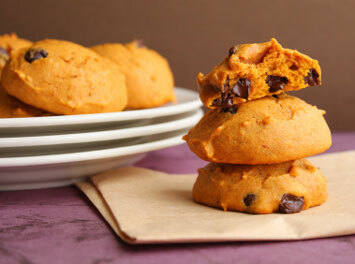 These pumpkin chocolate chip cookies would also go down a treat at a Halloween Party. They are so easy to make, the kids could easily make these themselves (perhaps with a little help). Preheat the oven to 180°C / 350°F and line two cookie sheets with baking paper. In a large mixing bowl combine the pumpkin, sugar, apple sauce and egg. In a separate bowl sift together the flour, baking powder, ground cinnamon and salt. Place the milk into a cup and dissolve the baking soda with the milk. Make a well in the center of the flour and add the milk. Keep stirring as you add the milk. Then stir the flour mixture into the pumpkin mixture. Add the vanilla, chocolate chips and mix until all the ingredients are combined. Drop spoonfuls of the mixture onto your prepared cookie trays and bake for approximately 10 minutes or until your cookies are lightly browned and firm to the touch. Remove from the oven and leave to cool slightly on the trays. Then transfer to wire rack to cool completely.